Miss Harper, the abused pit bull puppy who was first discovered in September, has found a friend in the Nassau County Police Benevolent Association. The PBA announced today, January 31 that it would donate as much as $5,000 to help cover medical expenses for the seven-month-old dog. When the Nassau County Society for the Prevention of Cruelty to Animals (NCSPCA) found her, Miss Harper had sustained serious injuries; both of her ears and right hind leg had been cut off, and she was suffering from severe infections. Dr. Bridget Brooke and her staff at My Pets Vet in Huntington took care of the maimed pup and set her on the road to recovery, but the young dog remains in need of several surgeries and a permanent home. Both ears have closed and will require an operation to be reopened, and she will need to be fitted for a prosthetic leg. 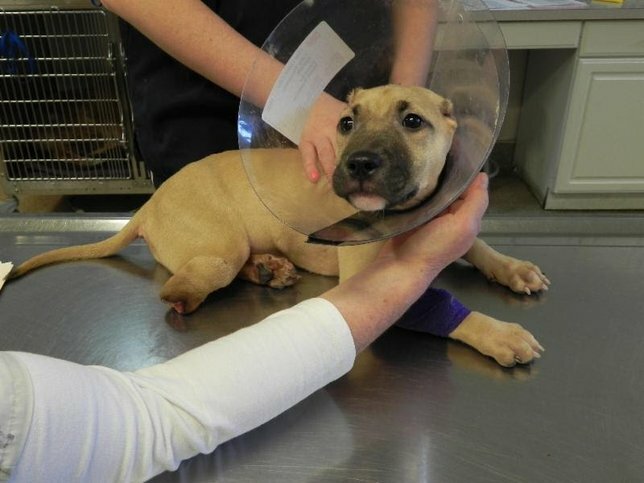 “We are asking the public and animal lovers to help us in our efforts to raise funds for the needed surgeries and care that this poor puppy faces,” said Detective Robert Sowers of the Nassau County SPCA. After news of her condition broke on Wednesday, offers to provide donations and to take her in poured in from across Long Island and other parts of the country. The NCSPCA is hoping to find a suitable home on the Island for Miss Harper so that she can continue receiving any necessary care at the Huntington veterinarian clinic that has been treating her. She will not be available for adoption until after surgery has been completed. "We've already received hundreds of calls to adopt her, but we want someone with extensive experience with the breed and someone who lives on Long Island," Sowers said at a press conference this afternoon. An investigation into the circumstances surrounding Miss Harper’s torture is being conducted by the SPCA and NYS Attorney General’s Office, but no updates on its progress are available at this time. "Hopefully, in the near future the people responsible will be brought forth... and prosecuted to the fullest extent of the law so the public can see the type of things people are doing and we can stop this from happening in the future," Sowers added. For more information about the Nassau County SPCA, click here. To donate, click on the "Donate" Tab on their website. To donate directly to Miss Harper’s recovery, click here. Subject: LongIsland.com - Your Name sent you Article details of "Nassau PBA to Sponsor Treatment & Care of Brutalized Pitbull Pup "Miss Harper""